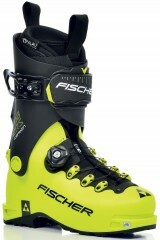 Welcome Fischer to the skimo boot club. And what an entrance! The Travers Carbon is a compelling ski boot that weighs barely a kilo. It has the torsional stiffness of an alpine boot, due to the placement of a carbon fiber sheath in the sole. It has an incredibly smooth fit dial on the forefoot: a BOA cable rigged around brass pulleys. It has a rugged Velcro upper-buckle that controls the stiffness. It has a simple ski/walk mode lever for quick changes. It has a robust, waterproof liner cover to keep the snow out. It has 80° of ankle articulation. Did we mention it barely weighs a kilo? True story. No-Torsion base is built with a layer of carbon fiber in the sole to prevent twisting*. Waterproof gaiter affixed to the lower shell keeps all outside moisture off the liner. Lace Frame System is a BOA closure that enables a precise fit with a simple twist. Active Cuff is a free-pivoting cuff system with incredible range and lack of friction. Forefoot width is on the plus side for the categories of racing and lightweight touring. Comfortable Palau liner is heat moldable and easy to get on and off with webbing loops. Phatt Maxx Tour buckle is a combination buckle and adjustable Velcro power strap. Simple rear lever-throw is stiff and tucks neatly into the cuff when walking. FYI, Travers (not traverse) is an amalgamation of the words TRAnsalp and VERSatile. * With tech bindings, the boot sole is the bridge between the toe and heel, and a more rigid connection results in greater power transfer. Update 2016/17: Fischer updated the sole after the early production run of spring 2016 to prevent premature wear. All our stock has the update. I'm in a 27.5 F1. What would your recommended sizing be on this boot? The 27/27.5 or 28/28.5 shell? Hi Josh, that would depend on your fit in the F1. Is it loose or tight? Do you think your feet would want to round up or down? I'm looking for a good light touring boot with a WIDE toe box area. Does this boot have a wide toe box? If not, what would you reco9mmend? Scott, You need to define WIDE. You can fill out our boot fitter at the top of the boot page. This boot is a 100 mm last. Dynafit boots have a wider toe box, Atomic boots punch out quite nicely. Finding a boot that fits you well and modifying from there if necessary will best get you into a light boot. I am on my 3 years on a Fischer Travers boot (my third one since i work in a small shop). I like them a lot (i should say i love them!!!!). My only problem is heel lift when in touring mode. Everything fit perfectly sizing wize BUT i always have a bit of heel lift. Put a shim inside on the heel block. A bit better. Not heat molded them. It is like my heel or hankle are thin a little bit. My feet is sliding back and forth very very lightly. No boot fitter in my area. Do you have a suggestion? Hi Guy, it's possibly the boot is not a good fit for you in the heel area. Feel free to stop in and we'll check it out! What is the difference between this boot and the non-carbon "Fischer Travers" which appears to be only available overseas? The weights seem identical... iirc the carbon adds torsional rigidity. Anyone skied the non-carbon one? Can't find any info on it. Yo Mark! You nailed it. The Travers is the same as the Travers Carbon, minus the carbon sole. I think that we can get the non-Carbon version if you're interested in it? I asked around and it sounds like nobody here has skied the non-carbon one, but Jason and Eric have been skiing the Carbon version for as long as I've been working here and it seems like they have a hard time finding a boot that will rival its stellar balance of walkability, skiability, weight, durability, etc. Follow up to 11.02.18 review. Skimoco type, Transitional, touring faster, going out farther, taking fewer breaks and seeking steeper lines. To date this season, I have ascended more than 34,000 feet and have near 140,000 feet on the down in these boots. Ok, I admit it, I ride the chair to ski with the commander (my wife). Coming from a 120 "flex" freeride boot as a daily driver to this soft flexing but laterally stiff AT boot was an eye opening experience. In a good way though. The softer flex has helped enforce what has been beat into my head regarding weighting the balls and heels equally and keeping the body centered to forward on the ski. The back seat is no place to be in these boots. When looking at the boot from aft, it is clear to see the cuffs are canted outward quit a bit and getting the inside ski, inside edge to do some of the work has been quite a chore. It is getting easier getting the knee into the hill by doing a few catch and release drills each time out. Now for the fluff stuff. The cuff range of motion is quite large and the cuff rotates with no resistance. The Velcro strap is easy to adjust and has a large enough adjustment that may be loosened and the buckle left closed. The cuff lock lever may be locked and unlocked easily with gloves on and the lace liner is easy to secure. The boa system closes the boot around the foot rather than down on it. More than shaving time off ascents and being matched well to the softer skis I am riding, the Traverse Carbon boots are helping keep knee joint pain to pretty much non existent. They are comfortable, warm and perform well for my type of touring and skiing. In fact, the boots are helping me cross over, without hesitation into the Type III fun zone more and more. I would to thank the Skimoco group for educating me with regards to narrower skis and softer boots. So I got these because several reviews claimed they are good for people with high insteps. I agree, but not out of the box. I had to get a small part of the boot heated with a ton of padding added to my foot, and now there isn't really any pressure point. But my instep is REALLY high. They tour like a dream, transition with a quick buckle and switch, and ski very well for the weight. I wish that they had a carbon or other such stiff material built into the liner tongue, to spread out the cuff pressure. That would be sweet. This was the first day with the boots and I was more than pleased with fit and performance. The only modification to the boot was installing a previously made pair of custom foot beds. My foot measurements, which I am including may help explain the size I chose. I attempted to try a 296mm shell (at another shop because I was curious about the boot). That didn't work out so well. For this tour up Collins, the boots were paired with 170 cm K2 Annex 108's and Fritschi Vipec's (White). Snow quality ranged from slushy at the base to heavy dense high butterfat content snow at the top of Collins. On the up, the cuff range of motion (ROM) was far superior to any boot I have owned and foot/liner movement was non existent due to the liner laces. The ROM was so good, I kept unlocking the toe pieces with every few strides. The toe lock problems were my fault, the bindings were set up to another pair of boots and I should have changed to a toe clip with a lower height. Could a boot this light having such a large cuff ROM with no resistance ski well? I wondered if this was going to be similar to driving a very old semi truck with bad brakes, no clutch and loaded up with a piece of heavy construction equipment on it's trailer, down Parley's Canyon. To my relief, that scenario did not play out. The first few turns on the donkey path to High Main were slow and calculated so I could get some feedback on what I got myself into. Then, heading down High Main it was time to shed my Type II binky and lean into what I hoped would not be a sucker punch. (cue trumpets, sun breaking through the clouds) The boots did what they were meant for in today's conditions and allowed me to ski passively aggressive. I was relaxed and comfortable making more turns and skiing faster than I normally would in these conditions. This being the first day on snow with the boots was a pleasant surprise. The boots performed up and down better than expected and were comfortable. I will follow up as soon as conditions improve and I have more time in the boots. Had it not been for the Skimo on-line bootfitter, I would not have considered this boot. If I'm a 27.5 in the Dynafit TLT7 Performance, what would you recommend in this boot? Thanks! Not an employee, but I demoed the 27.5 TLT7P and it fit me very differently than my 27.5 Fischer Travers Carbon. My toes were bunched up against the TLT7P toebox, whereas they're perfect in the Travers. The entire forefoot area of the TLT7P was quite wide compared to the Travers, imo. If the TLT7P fits you well, I'd be wary of the Travers, and vice versa! Hi Forest, in general you would go for the same size in those two boots. But note, as mbillie1 points out, they do have a different fit profile so it might not work perfectly for you. From what I read these boots have more metatarsal room the TLT5, maybe the TLT6 and maybe the same as the Scarpa F1--correct? Do the liners have to be thermomolded, in other words to they shape to the foot with mild use? If they need to be molded, is the Intuition rice method effective/suitable? Finally, I assume the volume is sufficient (as in the TLT6 and F1) for an aftermarket footbed, correct? And post finally, do you know where these boots fall in ramp angle between the TLT6 and F1? IMHO, the TLT6 has substantially more ramp angle than the F1 in my MP29 boots. Hey Andrew! Good to hear from you! I'd say that the Travers Carbon is in between the TLT6 and F1, but maybe a bit closer to the F1 in terms of forefoot width. You can definitely mold the liners but they are thin enough that after 5-8 days of skiing that'll pretty much take care of it. I think that if you are getting a distinct pressure point somewhere in the boot then you should probably mold the liners, but otherwise it's probably not necessary if the boot is fitting fine. Volume is a decent amount higher than the TLT6 and I'd say probably a bit higher than the F1 even so yeah, there's definitely room for a thin footbed in there depending on your fit, a footbed might even be beneficial. No official word on the ramp angle, but based on the design theories of the rest of the boot (Fischer built the boot based on a very powerful foot position that's slightly different than other boot manufacturers) and based on what I personally have experienced in the boots, it seems like it's pretty dang flat. I guess what I'm meaning to say is that the heel has never felt excessively tall or anything. Looking seriously at these boots for endurance and fitness touring, not ski mountaineering or racing. They will drive an Atomic Backland UL 78 ski. Due to my messed up feet I need a wide boot and wear size 12 shoes. My new Scarpa Maestrale RS boots are size 28 and fit incredibly well, my best boot fit ever, especially after you punched out the toe boxes. My 28 Maestrale RS's have a BSL of 314mm. 1. 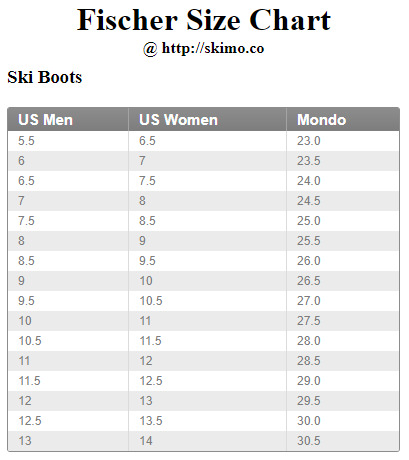 How does Scarpa sizing compare with Fischer? Do you think I could fit into a 28 Travers Carbon? 2. Have you had success punching the Grilamid shells? 3. A size 28 Travers Carbon BSL is 306mm. Can you mount my ATK bindings with the 30mm adjustable plate so that it would fit both boots? 4. Are folks happy with the Palau liners? If not, which Intuition liner do you recommend? 5. Is there another sub-kilo boot that would fit a wide foot that I should be considering? Hey Dabu! Why don't you fill out our online boot fitter and we can dive into the details over email? Let me know! Hi Dabu, yes these can be punched without issue. No problem mounting for those two boot sole lengths. There are various Intuition and Palau liners to it's hard to compare them all; the stock liner is on the low-density side in the Travers. The TLT7 Performance and Carbonio are also on the wide side and very comparable. Time to post up a review for these boots. I've put a little over 100k of vertical on them now, all aboard a set Fischer Alpattack skis and bindings. By far the most comfortable out of the box fit I've ever had in a ski boot. This is my first uphill boot moving from the BD Factor 130 and I am amazed by the combo of ski-ability and lightweight. While not a pure race boot they haven't slowed me down too much in my first season of racing. The simplicity of these boots is perhaps the biggest feature - simple walk lock using rear bar, easy to use power-strap latch and nicely designed BOA lace system all designed around a full liner and gaiter. No hidden cables or walk mode locks to break in the backcountry. My only complaints - occasional ice build up in the walk lock/heel interface and the power strap is too long (typically ski 1cm past shortest marking). Both of these are truly nitpicks and have very little performance effect. I'm very excited to use the boot with a new Salomon X-Alp setup for spring tours and PNW Volcanoes this summer. Should be a perfect 1kg boot + 1kg ski combo. At some point I will be looking to upgrade to a race boot, but I won't hesitate to use these regularly in training. The only disadvantages are a bit of extra weight, non-booty liner, and two step ski-to-walk when comparing to a true race boot. With that said the range of motion is still very impressive for a full liner boot comparing to those I've tried on. How flat is the boot board in the Travers and is it removable? Also how does the heel fit compare to the Dynafit TLT5? Hi Herb, this boot actually does not have a boot board inside, but the sole of the boot is pretty flat. In comparison to a TLT5 the heel pocket is well defined but slightly wider in the Travers. I've been using these for this meager season, ~50k vert on em over a number of smaller days, including a few races. Disclaimer, these are the lightest boots I've used so I can't compare them to proper skimo boots. My previous boots were green TLT6Ps. I've been skiing them MOSTLY on 177 Movement Response-X w/race bindings and 179 Down Countdown 102Ls with race bindings, occasionally with 180 G3 Manhattans with Radical STs. Firstly, these walk, skin and boot beautifully. I thought the TLT6P would be hard to beat in terms of uphill performance, but the Travers make the TLTs feel like alpine boots. A noticeable 5-6" additional per stride is possible with all the rearward flexibility these boots offer. Secondly, they ski great. I would say that, when you really tighten the strap, they do not give up much if anything to the 6P in downhill performance. I even took them inbounds with my heavy kit (~1900g skis + ~500g bindings) and was stunned how well they did. They're super warm, the Boa system gives a very nice fit around the foot, the gaiter keeps the snow out when it's deep, and they ski great. What's not to love? I'm not a big velcro guy and I wish the strap was a bit more adjustable, I've got fairly skinny lower legs and I end up with a good amount of "tail" left over when I really wail down the straps, but it's a small gripe, and I suppose I could always cut the extra off. So far it hasn't failed to hold, even when somewhat snowy. I'm super happy with them. They improve on my TLT6Ps massively in uphill performance, markedly in warmth, while giving up <= 5% in performance, maybe nothing. If they had a non-velcro upper buckle I'd probably buy a backup pair just to hoard. update with ~45 days and ~100k' hiked on them, these are the best boots I've ever owned. the only noticeable wear is one of the ski mode levers had the tiny piece of accessory cord rip off, which I rarely used anyway honestly. update with 100+ days and 300k'+ vert: just buy these already. Hey. I'm really interested in these boots vs Scarpa Aline RS. Do you have your own comparison between the two? What is the last of Fischer's sole? Scarpas have 99mm. Will be grateful for any further hints. Hi Kamil, yes we have a fit profile worked up for all the boots on the site. The Fischer is noticeably wider than the Aliens, and has different length sizing. Visit our boot fitter for a detailed workup. What is the sole length of the 26.5? Hi Johnee, it is 286mm. Hi Bob, from what we have seen working with the Fischer Travers and the Vipec bindings, there should not be a problem with this boot releasing from the Vipec appropriately. I ski a 26.5 in a Black Diamond Quadrant and am looking to upgrade to a lighter setup and eying the Travers. Will their sizing be consistent with Black Diamond? I had the toe-box slightly expanded in the Quadrants (I generally lean towards adding volume to a smaller boot). Thanks! Hey Luke! Yeah, sizing sounds like it'd be the same between the two boots! Hi Luke, lengthwise they are similar but the BD is a wider boot. You could slightly expand the Fischers as well, but I'm guessing a 27 might fit a bit better out of the box. For more details, visit our boot fitter. Is the entire cuff made from carbon fiber (so it is difficult to punch or bend outwards)? Hi Richard, it sure isn't! It's plastic and punchable. I used these boots throughout winter 2017, probably ~130k of vert and many days and hours, including a couple of hut trips in Idaho, a bunch of Utah powder days, even the Powderkeg. Can't say I abused them by trying to do rocky ridge traverses and mixed climbs or anything, but I did walk about 5 miles of City Creek pavement in them once. For reference, I ski in tecnica inferno 130 boots in the resort and have previously used Mercuries, ONE's and the Maestrale RS for touring. In all those boots, I've used intuition liners and custom footbeds. Touring on Voile Vectors 180 with Superlight 2.0. Maybe I got very lucky on these, but it's the only pair of ski boots I've ever had that did not require any fit modifications. In all my other boots, I've had issues with width and instep height, so I would imagine that this boot is fairly wide in the forefoot and the BOA system is forgiving on the instep. The heel hold when the liner is new is fantastic and, even now that the liner is pretty packed out and showing signs of wear, is still good. I do wish the cuff could be tighter, the buckle power strap design limits the amount of velcro you can pull through and I have it on max tight all the time, but I'm used to cranked down alpine boots and I like to ski the front of the boot if that makes sense. I would like it if they had an extra molded spot to move the buckle. The Palau liner is very thin, light and flexible and is perfect for this boot IMO. That said, it has worn quickly, to the point that I have thought about trying to get a new set. The gaiter system is a tad fussy, but I haven't had any issues with snow intrusion and it makes the walk mode much more free. The BOA system works very well, I can crank it down and achieve a close fit without pressure points. I think this contributes to the great heel hold. Zero reliability issues. Ski/walk mechanism is a simple solution that works really well. I see no reason for the more complex mechanisms in some boots. There is a tiny bit of play in ski mode that I notice on the bench, but it doesn't bother me when skiing. The cuff buckle/power strap has a really nice long throw that enables you to leave the power strap tight, unbuckle for full range of motion and buckle to ski. No fuss, no problem. Empowering! I think the range of motion is better than the hiking boots I have to wear all summer. I've never used race boots, but these have got to be close. 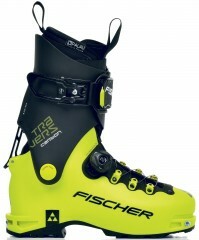 I've tried on F1s and TLTs and they don't come close to the Fischers. I barely use my heel risers now. Transitions are pretty much fuss free, with just two easy lever throws per boot. Would be cool if they had a one lever action a la race boots, but no big deal. Like I said, I walked about 5 miles of pavement in them with no issues (other than my burning desire for Domino's, but that had nothing to do with the boots). Also, they are very warm, possibly due mostly to the good fit, but my feet haven't gotten cold anytime other than a zero degree dawn patrol. And that was probably due to some sensitivity from a bit of recent frostbite. These aren't powerhouse stiff boots, but they do feel intuitive, skiable and confidence inspiring. I don't go out into the backcountry to crush crud and rail groomers anyway. The upright forward lean is one of the reasons I bought these, having had issues with ramp and lean on past setups and it works well. Combined with a nice, easy ski like the vector, I think I ski better and more confidently in these boots than on my past setups (huascarans and mercuries). The torsionally stiff sole and the "duck-foot stance" thing mentioned above might be beneficial here, but I can't really tell enough to say. All I can say is that they ski well enough that I wouldn't hesitate to use them on any terrain. I wouldn't be charging, but I could make a nice turn and be in total control. No issues here, other than the liner packing out, which doesn't really affect the performance of the boot very much. Sole shows basically no wear, but I haven't done hardly any rocky bootpacking stuff. Seems to me it would hold up well. Bottom line, for me, backcountry gear should be intuitive, light and reliable and these check all these boxes in spades. I never think about them when I'm touring, they just work. Nice review, simple and straightforward. Getting a pair from Skimo this fall. Hope they are still got it going on for you. I've had these now for about 6 weeks but have already put nearly 150k of vert on them thanks to a perfect spring in New England and a 2 week trip to Norway. So I've had the chance to use them in nearly every type of snow, and have skied them with Hagan Ultras and the Fischer Hannibal 94s and 100s. They drive the bigger skis surprisingly well even in challenging conditions (hot pow, crust, etc). The full gaiter is awesome and the boa cinches evenly and snuggly. The power strap and ski/walk lock are beautifully simple and fast. For most touring/non race skimo applications I don't think having one mechanism is necessary. This is nearly as fast. The boots are pretty serviceable as well (boas string is easily replaceable, and buckle, power straps and ski/walk lock are also attached by bolts, so replaceable as well). Only thing I'd like to see is the boa itself attached by something other than rivets, and cuff rivets be replaceable - we'll see how long they last). With steeper the skinning I don't notice the slightly less range of motion compared to my syborgs and Pierre Gignouxs at all. The only time I notice it is skinning on long, flat approaches. I don't think they have quite as much rearward cuff mobility if you're doing more of a nordic diagonal stride. That's probably not an issue for most folks. Initially the toe box was a bit tight but adding a shim under the ball of my foot and getting the inside of the boot blown out a few mm solved that. Easy cheap fix, and expecting a plastic boot to fit perfectly right out of the box is unrealistic. I wore them for probably close to 80 hours in the last two weeks and feet didn't feel beat up at all. Durability so far seems pretty solid even with a good amount of off-snow travel, rock scrambling, etc. My feet measure 285/287 mm. I went with a 28.5 in these, 29 in syborgs and 29 in PGs. I have slightly less room in the toe box than the other two but these fit well. The tech bsl is identical to the syborgs.